Businesses that need their teams to create, communicate, and collaborate can turn to Zoho Workplace for a solution. This collaboration software bundles into one platform apps on document management, email, chat, presentation, and communication tools. Once they decide to get Zoho Workplace, businesses get Zoho Writer, Zoho Docs, Zoho Sheet, Zoho Show, Zoho Mail, Zoho ShowTime, Zoho Chat, Zoho Connect, and Zoho Sites. Zoho Workplace continues Zoho’s tradition of bundling tools and apps to better serve customers. 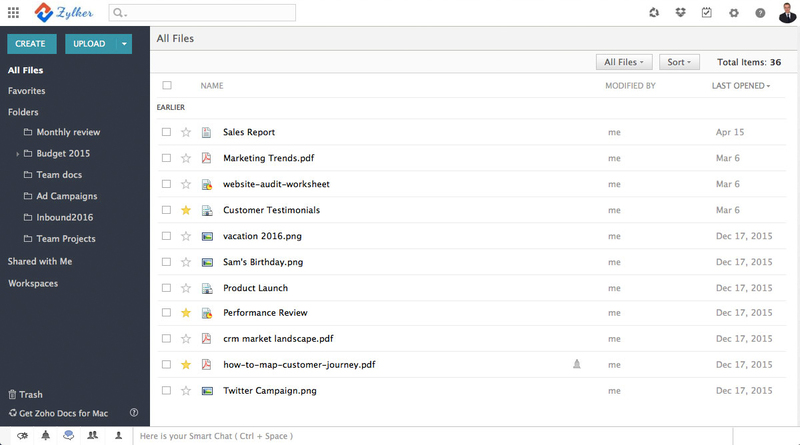 In particular, the Zoho Workplace business office suite includes Zoho Mail as one of its components. The word processing tool Writer, visual presentation tool Show, and spreadsheet tool Sheet all help teams create. Collaboration is represented in apps like Sites, a website builder that utilizes drag-and-drop; Showtime, a presentation tool that can be controlled from a phone; and Docs, which lets teams save and share their work. Communication is enhanced through instant messaging apps like Cliq, a hybrid inbox for email and social media, and a single platform like Connect, which brings people and resources together. Team efficiency and productivity can be boosted with all of Zoho’s tools and capabilities. Zoho Workplace allows businesses to go paperless as it lets users share files; communicate in real-time; create, store, and access documents; and build proposals and stunning proposals all in the cloud. Zoho Workplace provides all of that and more. Team members can be productive wherever they may be, as Zoho Workplace has a lot of mobile apps that let them work on the go. These apps include Docs, Writer, Sheet, Zoho Mail, Inbox Insight, Zoho Mail Admin App, Showtime, Connect, Cliq, and Streams. Managers who handle remote teams will find all these apps very convenient. Zoho tools and apps easily work and integrate with one another, so there is no need to add any third party apps or integrations. Zoho Workplace has the right tool built into it for almost any job. Zoho Writer edits documents, Zoho Sheet edits spreadsheets, Zoho Sheet edits presentations. Zoho Docs stores and manages files, while Zoho Showtime has tools for audience engagement and presentation sharing. Zoho Mail has a modern business email. These and many more apps are available to users. One of the best things about Zoho Workplace is that a forever free version exists for companies that have small teams. Basic office functions are covered by this version, with the option to upgrade always available once businesses grow. Zoho’s products are also ad-free, whether they are free or premium. Zoho takes customer feedback seriously. When users called for more Zoho Mail storage, they increased the 10GB of storage on the Standard plan to 30GB, and the 15GB of storage on the Pro plan to 100GB. Improvements to the Zoho Mail infrastructure are always being conducted to make it reliable, faster, and more secure. Inboxes are kept clean by new spam algorithms, and support teams have been strengthened to reduce response times and handle increased support traffic. Integrations with other Zoho apps are quick and easy. Several apps can also integrate with external services, platforms, and apps.